It's a well-established truth: You will always have more food storage container lids than actual containers. Why is it that kitchens somehow turn into the black holes of paper goods, storage containers, and more? Shouldn't there be a better way to organize the kitchen so that you can find what you need -- when you need it? And without a chorus of frustrated curse words? Follow these steps and steal these storage ideas to put your kitchen cabinets back in order -- permanently. Things are going to get a lot worse before they get better. But this step is so necessary. If you skip it, you'll end up shoving things in places where they don't truly fit. So first, take everything out of your kitchen cabinets and put them on your counters and floors. With everything out of the cabinets, you can now see you have waaaay too many kids' cups and seven storage container lids that don't have partners. Get rid of everything you don't need, don't love, and don't use. Sort your items into groups that make sense: all plates and bowls together, all spices in one area, etc. Keep food and dishes/small appliances separate. Then, think about where the items will make the most sense. Dishes and appliances that are frequently used should be within easy reach, while special occasion items can be put a little more out of the way. Store dishes and glasses near the dishwasher for easier cleanup. Store food in a pantry if you have one. If not, put food in the top cabinets. Store appliances below your main work area for easier prep. Store pots and pans in the bottom cabinet. 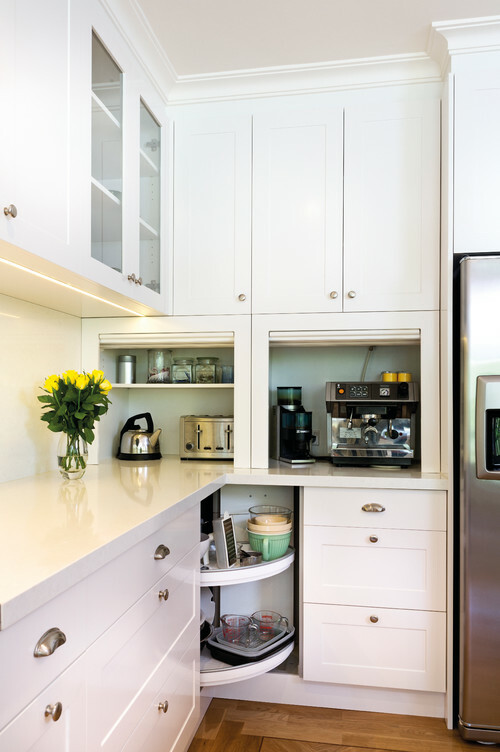 These nifty ideas will help you make the most out of the cabinet space you have. Consider deep drawers instead of lower cabinets. Being able to pull the drawers open makes it easier to retrieve pots and pans and more. Plus, the space is less likely to turn into a jumbled mess. 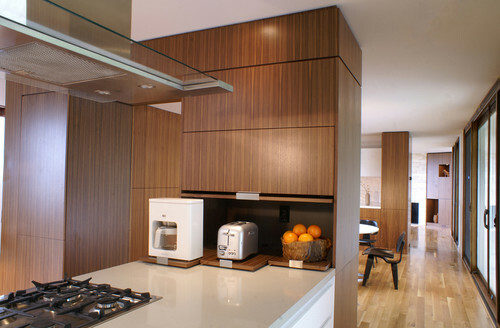 If drawers work well, why not sliding shelves in your upper cabinets? Sliding shelves allow you to pull your spice shelf out so you can more easily find that oregano that always seems to go missing. If you have a large kitchen, and can give up a little bit of lower cabinet space, consider converting a small area into a cutting board storage area. Adding dividers allows for your cutting boards to stand on end and be within easy reach during meal prep. You use your toaster, coffee maker, and blender every day, so it makes sense to leave them on the counter. But this is unsightly. Instead, install an appliance garage, complete with outlets, to keep your frequently-used items within reach, but out of sight. The lazy Susan is everybody's favorite organizing tool. If you have a corner cabinet that tends to swallow items whole, install a lazy Susan so you can reach what you need with a simple spin. 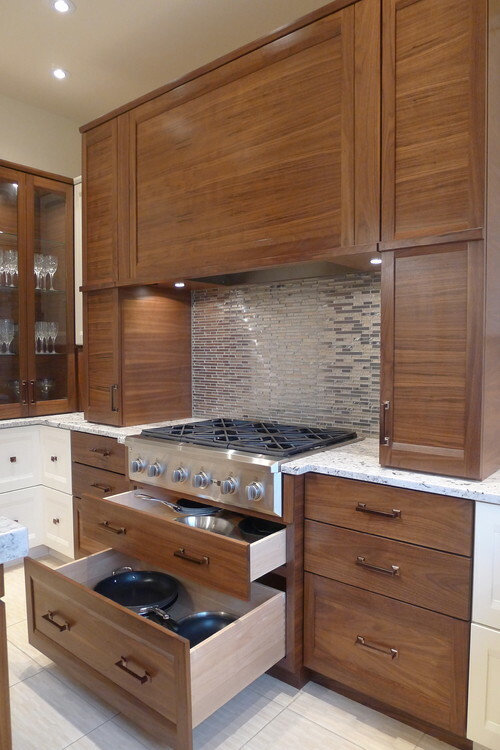 At New Life Bath and Kitchen, we're experts at thinking outside the cabinet box for customized kitchen storage solutions. 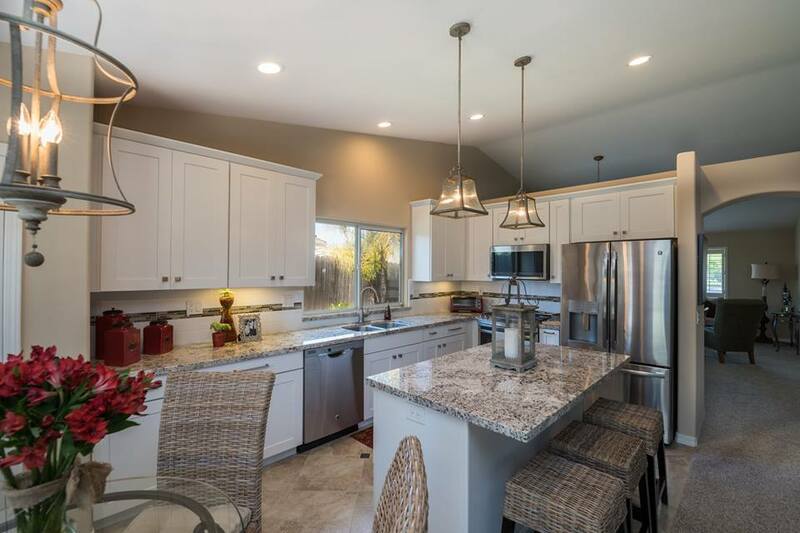 We don't subcontract our work, so we maintain control over your custom cabinets from start to finish -- which means you get to enjoy your organized kitchen much sooner. Give us a call at (805) 639-5433, or contact us online for a free consultation.